Thought I'd post a picture of my new iPod, dubbed the gimpPod because of the black wubber skin I bought for it. Pretty neat the way not one part of the actual pod is exposed, and the way the touchwheel can work beneath the rubber. Thanks to the lovely folks for a great birthday present. That little £106 bunch of stuff all came in a really ornate, exciting-to-open, 6-inch cube of packaging, with software CD-ROM and user manual. 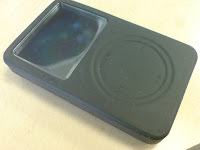 All those things are missing from the iPod now, which comes in a box about the size of a fat double-CD jewel case. At £240, it just comes with headphones (<1m cable), USB lead, and cloth bag. Most irritating is the lack of mains charger - I now have to find a computer every time I want to charge my iPod. So, if you do the maths, iPods are actually more expensive now than they were four years ago. Beware Sam, they also break very easily. I have had three ipods since 2005. Twice they have packed it in during the warranty period. Although I have to say Apple do make it really easy to pick up and replace faulty ipods. How could I go through three of them in two years? It is not as if I play football with them. This is definitely my last ipod purchase.